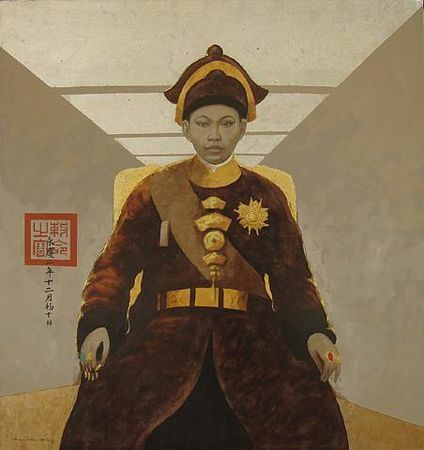 Bui Huu Hung, Royal Empress II. Lacquer on canvas, h: 135 x w: 127 cm / h: 53.1 xw: 50 in. photo courtesy Apricot Gallery. 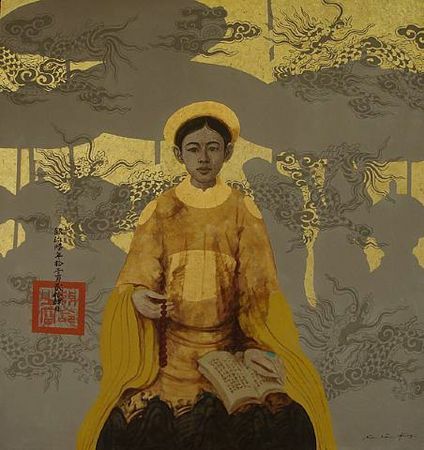 Recollection opens on Thursday 30th September 2010 and will introduce new works by the Vietnamese contemporary artist Bui Huu Hung. His works are striking traditional Vietnamese lacquer paintings with a contemporary twist, centred on a common theme – recollection and memory. Hung’s paintings reference the past in order to reflect the present, expressing ancient legends by depicting mythical figures against a background of illusory space. Consequently he does not paint portraits of real people from the recent past, but characters of an imagination inspired by the ancient myths and cultural folklore of Vietnam, which Hung admits are often very melancholic. His favourite characters to paint are women, whose faces are often depicted full of sorrow in a seemingly meditative silence. Many of the figures portrayed in his paintings are not central to the folkloric narratives but are often peripheral characters – the mother, sister, or a beloved of the hero. 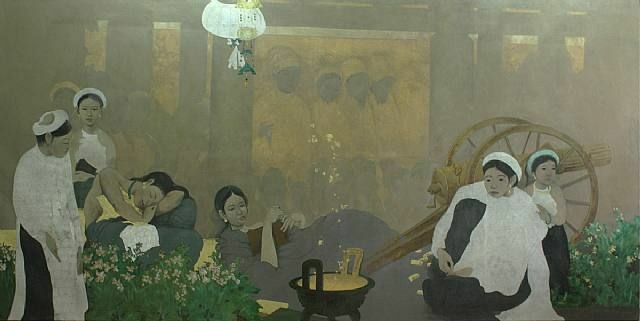 Hung is currently the first and only artist in Vietnam to have mastered the technique of painting lacquer on canvas. 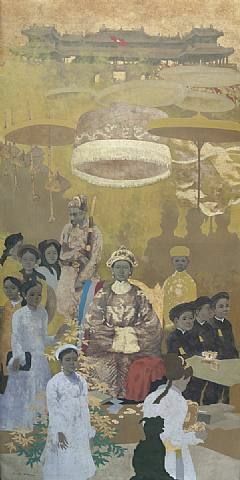 Confidently controlling these methods, Hung allows his characters to delicately appear from beneath the layers of lacquer. 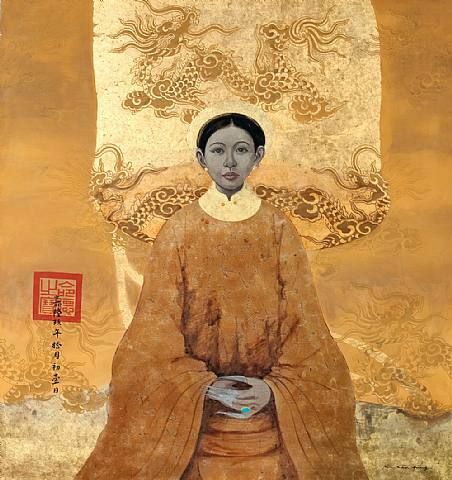 Expertly manipulating the lacquer through incorporating gold, eggshell or silver powder, the artist constantly references and retains the essence and versatility of this beguiling medium. 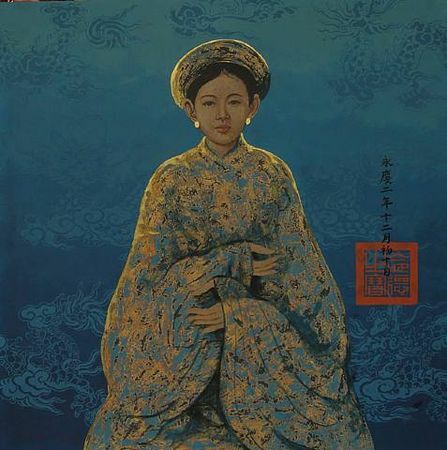 Bui Huu Hung, Concubine II. Lacquer on canvas, h: 135 x w: 127 cm / h: 53.1 x w:50 in. photo courtesy Apricot Gallery. 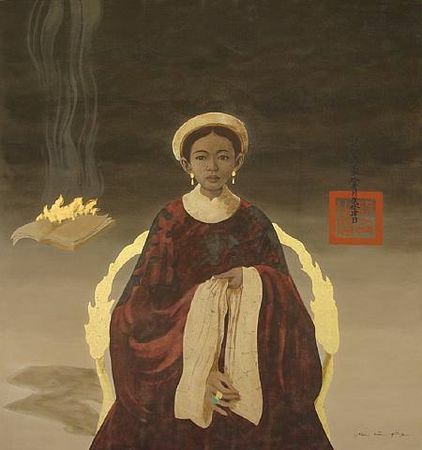 Bui Huu Hung, Concubine III. Lacquer on canvas, h: 135 x w: 127 cm / h: 53.1 x w:50 in. photo courtesy Apricot Gallery.